These three telescopes are all small and easy to carry – they could be described as “Pocket telescopes” but you would need a deep pocket, since they are all around 6” long when folded up. All with three draws, they are the shortest units that can perform reasonably well, without going as far as having a multi-draw construction, a design that gets heavier and larger in diameter in the pocket. All three of these are the same sort of length when extended, 17 to 19 inches. The interesting part is that these three illustrate several different aspects of design, and span around 120 years in terms of date of manufacture. So named because it is engraved “C.W. Dixey, Optician to the Queen, New Bond Street, London” on the first draw. Charles Wastell Dixey worked there (at number 3) from 1839-1862 – so the Queen was certainly Victoria – and prior to working on his own he was in partnership with his Uncle George, and supplied George IV and William IV too. Those telescopes were labelled G & C Dixey. This scope is of a classic design, with two lens cartridges at either end of the first draw, each with two lenses in the Schyrle-Huygens eyepiece arrangement, which is the format generally adopted for telescopes after 1800. An interesting feature of this design is that the sliders mounting each draw are sized very close, making a good seal on the outside of the smaller tube. 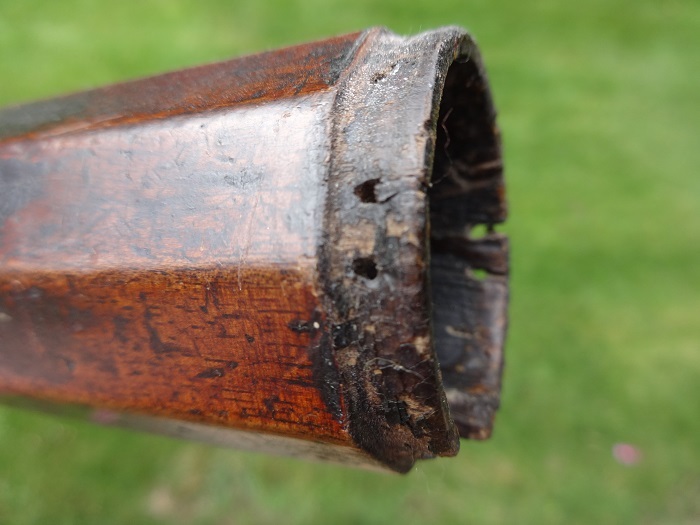 So Dixey added air release holes in each draw, to allow the air to escape as the scope is compressed. Because they are a good fit, he did not need to cut the full flap in the slider (that can be tightened using hand pressure) to enable later adjustment, that featured in many earlier designs. However he did make two parallel cuts in the slider on each side, creating a ‘double ended flap’ that can still be squeezed to tighten a little, if needed. 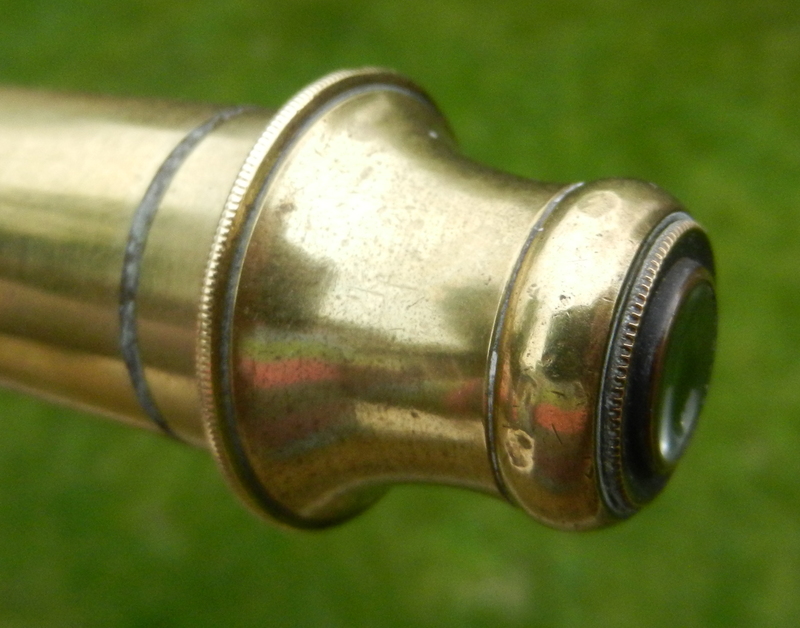 The different feature here is that the scope is all brass in construction, possibly reducing the maximum OD of the unit, compared to a mahogany barrel – it is about 1.25” OD round the Barrel, but 1.375” where the brass raised around the objective area. 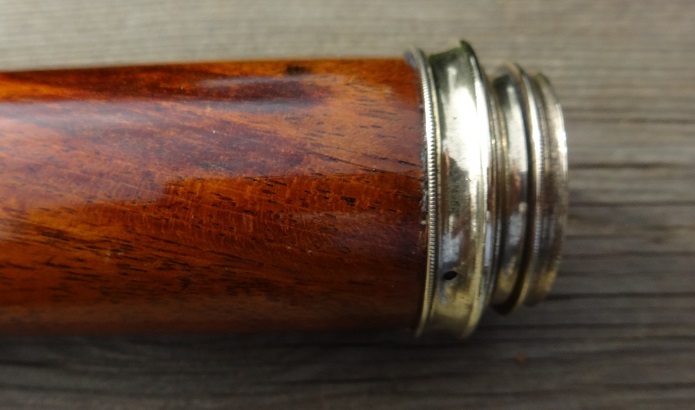 The outside of the barrel, instead of being leather covered, which became the normal covering later, is brass, with the surface scratched in a fairly irregular pattern, then coloured in a brown shade, to simulate the appearance of wood. The objective is a dual element lens, in an achromatic combination, held in place using a threaded ring on the inner side. It would appear that originally there was a brass protective cover fitted over the objective, this seems to have been lost. 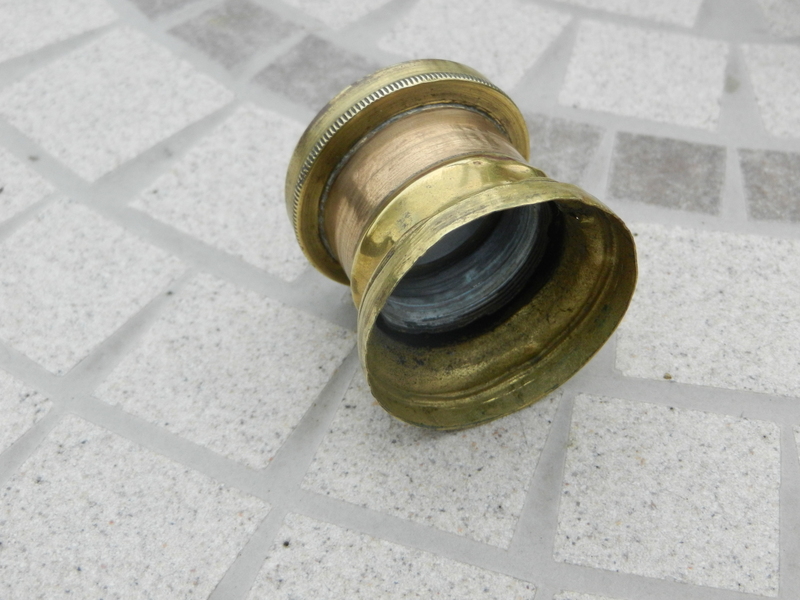 The eyepiece has a captive sliding cover in the screwed on cap. This cap holds the first lens cartridge in place, which is a push fit into the first draw. This Dollond is engraved ‘Dollond London x15’, all in capitals with the angular, heart shaped “O” letters. This dates it to after WW2, maybe in the 1950s. 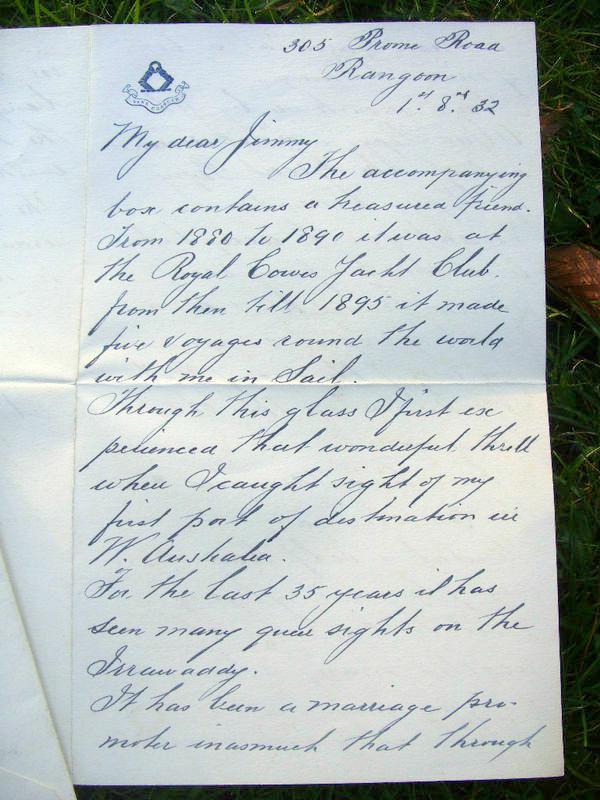 So it is 100 years further on than the Dixey: but still the same style of lens construction. The view through has the same sort of magnification, but the image is much bigger, and appears to give a wider field of view. 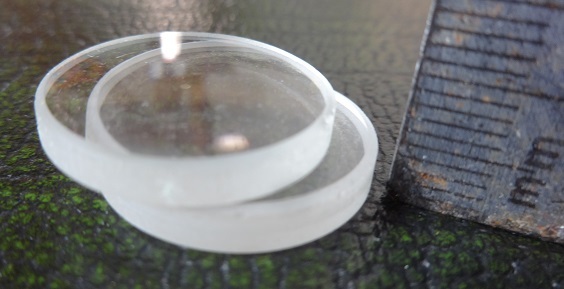 This could be down to the larger diameter lenses used in the eyepiece section: the three draws are altogether larger diameter and feel much stronger than those in the Dixey. 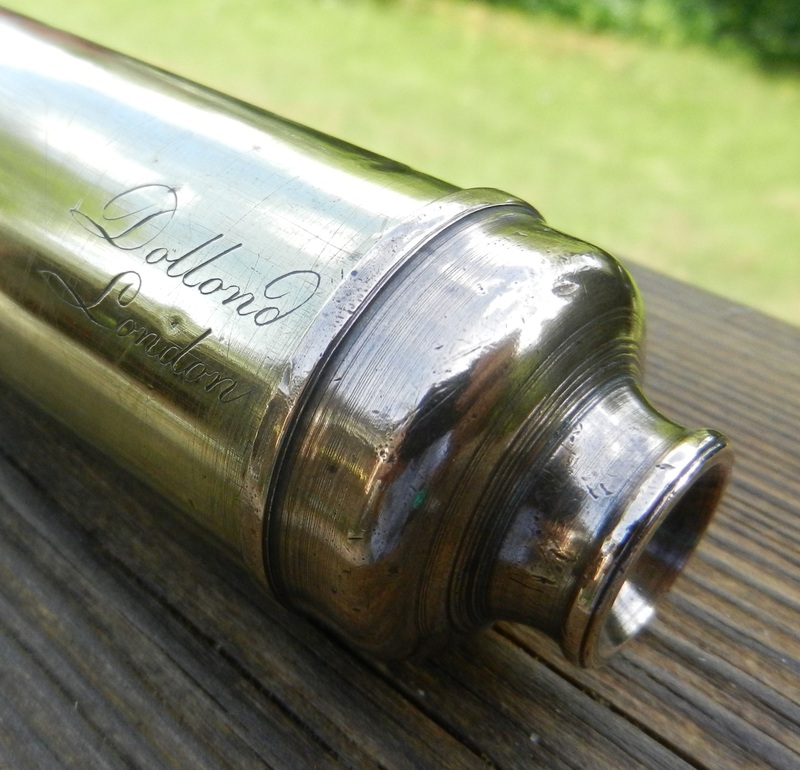 The barrel of the Dollond is also larger by a little, measuring 1.625” OD. The largest, third draw is 1.375”, compared to the Dixey at 1”. Where the Dollond scores comes later: it just feels right in the hands and is easy to use. 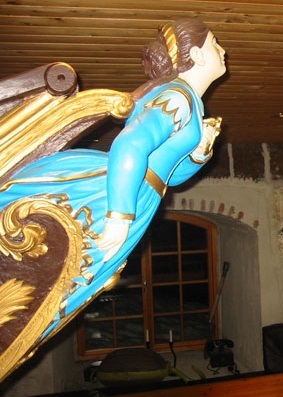 This one has the brass barrel covered in pseudo leather – which is probably real…. There are no markings engraved on this scope. 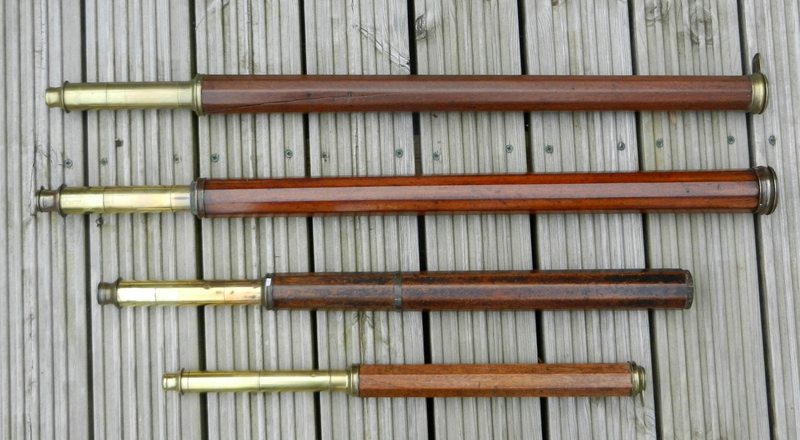 It appears to be a standard three draw, small scope from the 1800 -1850 period, but is in remarkably good condition. This is maybe because of the substantial felt lined leather case that came with it. It is a little unusual in that it has a brass barrel, rather than a wooden one, and this is coated with a veneer or similar covering. The surface of this veneer is textured, or roughened, to a sort of matt finish. It also has a sun shade over the objective, a third the length of the barrel, with a side sliding cover assembly over the lens that can be unscrewed. If the scope is used with this lens cover in place, but with the slider open, the diameter of the window opening onto the objective lens is only about 0.75”. The eyepiece cap screws into the top of the first draw, but this has an integral long parallel section, 11mm long, that prevents the first draw pushing further into the barrel. The three lenses in the Schyrle eyepiece design. The two lenses pictured still in the cartridges are there because their threads are too tight and difficult to remove. 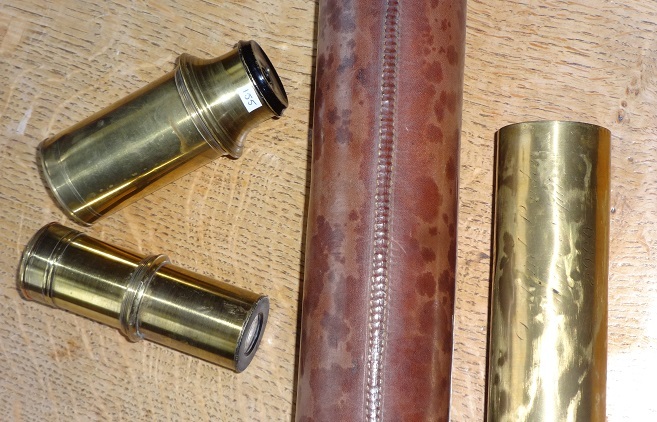 Both cartridges pictured have external threads on the bottom, to attach to the adjacent brass fittings. It is inside the scope that the real differences become obvious. This was a real surprise, after the outside looked like a conventional early 1800s design. First the objective is a single lens, not an achromatic doublet. Then there are only three lenses in the first draw, making up the eyepiece assembly. These are equi-spaced, by about 6cms, and the lens closest to the eyepiece cap is in fact at the far end of a 3cms long cartridge, maintaining this large distance between the observing eye and the first lens. Plus there is a ‘Field Stop’ orifice close to this lens, on the objective side. This is a different eyepiece lens system to normal, it is a Schyrle lens system. This was supposed to have not been used after about 1750, since the achromatic objective lens and the Schyrle-Huygens eyepiece then took over. The Schyrle eyepiece was popular from the late 1600s to mid 1700s, and was developed by Anton Maria Schyrleus de Rheita, a Capuchin monk in 1645. 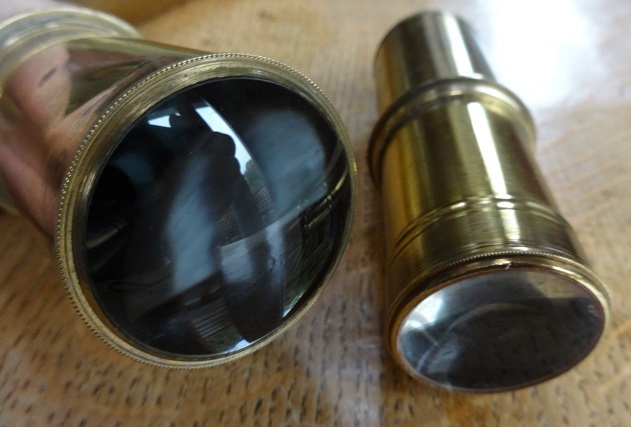 Others, notably Chris Lord, have suggested that Schyrle three lens systems were used on telescopes well into the early part of the C19th: the construction of this scope does seem to bear that out, in that it would appear to be of the style of the early 1800s. 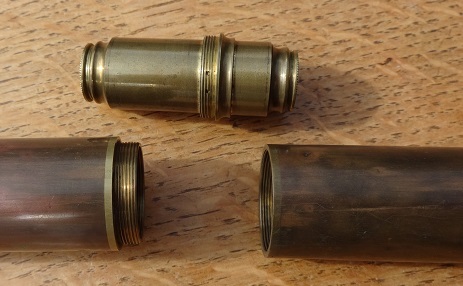 The internal connectors between draws are conventional, but close fitting brass to brass, such that there are no cut-outs that can be pressed down to tighten the connections up. A characteristic of the Schyrle system is that the positioning of the eye along the optic axis is fairly critical, and equally any misalignment of the lenses in the cartridges – for example by cross-threading – makes it difficult to locate the image (ie sometimes it is difficult to use the scope without just seeing a grey blurr!). The OD of the sunshade on this scope is 1.375”, and the barrel is 1.25”. The third draw is 1” diameter, like the Dixey. But as mentioned above, the window on the objective restricts its open diameter to 0.75”, whereas the Dixey objective lens visible OD is 1.125”, so gathering more light. Three scopes, all very similar in performance, but all with their different features. All are compatible with the Ramsden small scopes from 1790, and the Andy McNab scope from the C20th. It really comes down to which ones are easiest to use and carry! The Schyrle eyepiece system used in the third model is very unusual. It was seen once before in a James Chapman octagonal telescope in my collection, but this one really did date from the late 1700s. The scope described above looks to be a much later design, and in my opinion dates from the early part of the 1800s, maybe as late as 1840. A similar design of telescope, but one which uses the Schyrle-Huygens eyepiece system with 4 lenses in the first draw, and dates from around 1850, is the John Hewitson unit described earlier. “Dollond 4-inch Brass Refracting Telescope, London, c. 1825, Bywater & Co., 58-in. 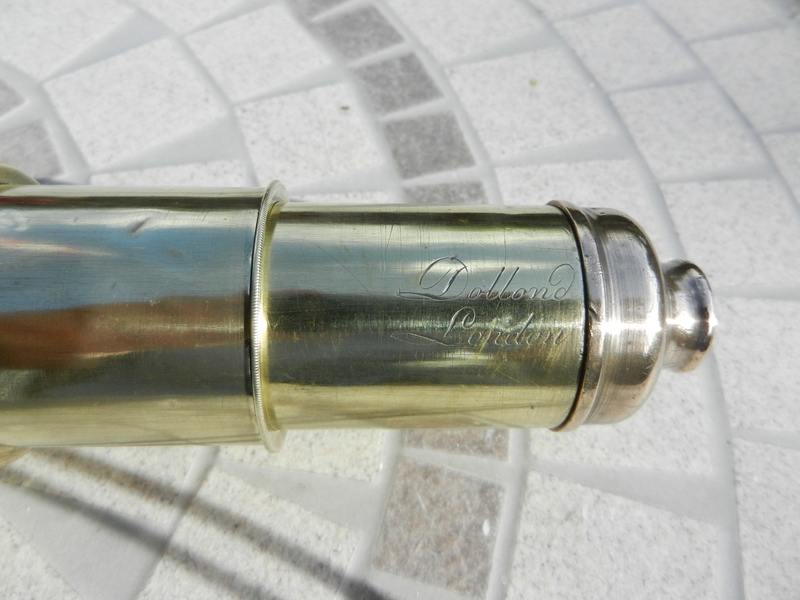 main tube, ocular collar engraved “Dollond London/Sold thru Bywater & Co. Liverpool,” mounting collar, and dual tapered column mount. Provenance: Descended in the family of Captain Theodore Corner and used at Corner’s Wharf in Baltimore by the shipping firm James Corner & Son’s in the mid 19th century. Family research accompanies the lot. The condition report was not as positive, as it suggested one unspecified lens was missing. Inevitably this explained the low estimate of value, and the scope sold for around the $400 suggested. 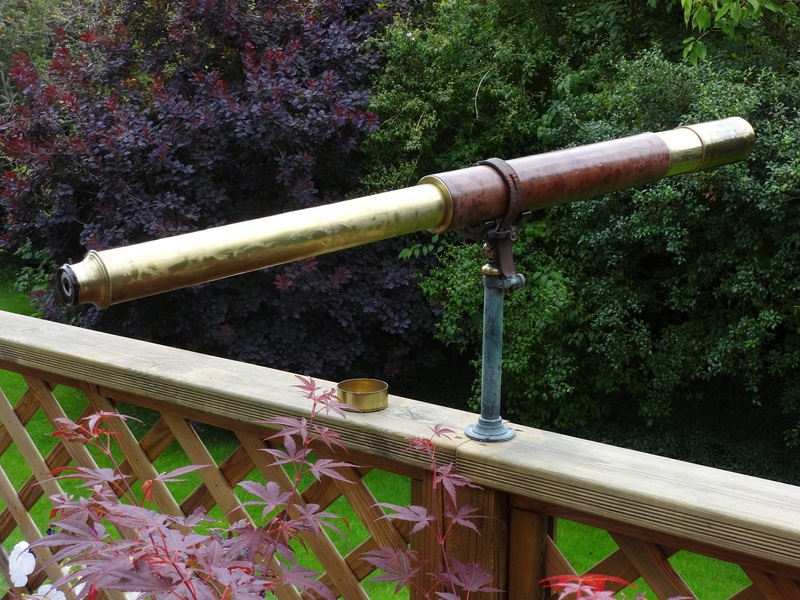 Another interesting and traceable telescope has been described by a correspondent in Maryland, USA, who has just resurrected it from her brother’s basement after 30 years in storage. 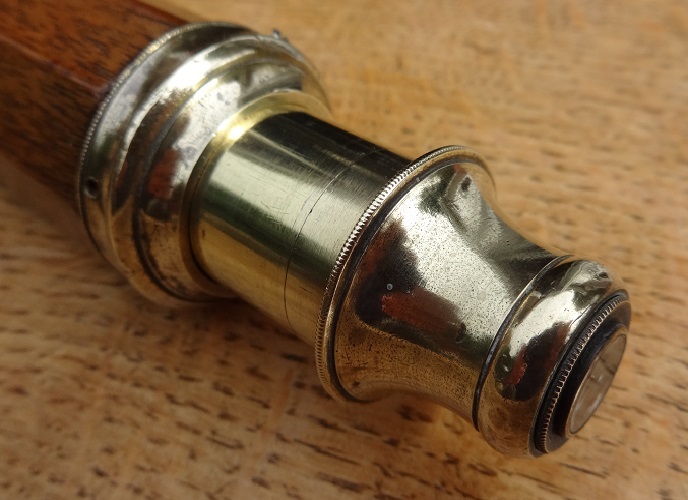 It is an approx 6 foot long Dollond, which fairly unusually can be dated to the 1820s, using the minimal supplier info engraved on the flange on the eyepiece end of the main barrel. This is a composite image, the tubes are NOT bent! 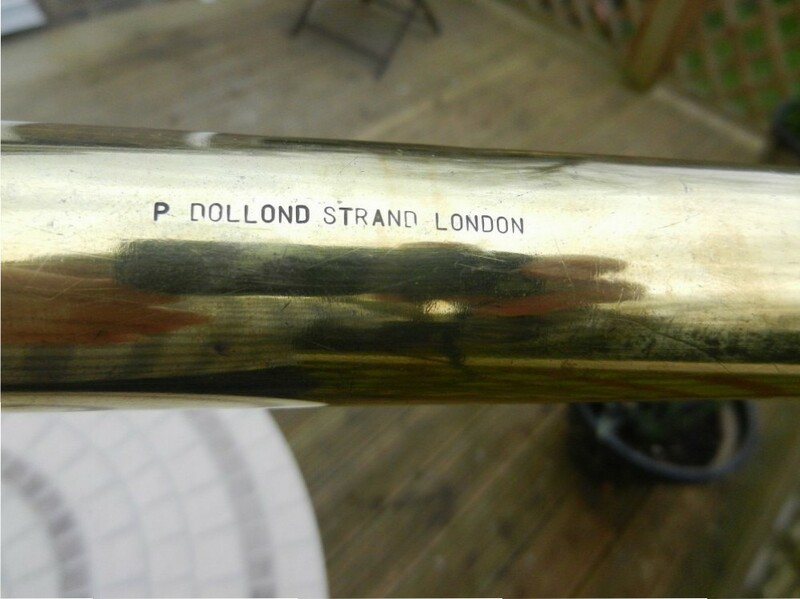 The engraving on the telescope says “DOLLOND * LONDON”, at the top, in capitals, and then underneath it adds “Sold Thru Bywater & Co, Liverpool”. Gloria Clifton’s Directory of British Scientific Instrument Makers suggests John Bywater & Co was the trading name used by this firm between 1822 and 1831 only. They traded from premises at various addresses in Pool Lane, Liverpool, in this period, and also from 42 Seymour Street from 1825-27. Further, Clifton confirms that during this period he was known to have sold telescopes made by Dollond: this comment was not made in relation to previous or subsequent identities used by this firm. In 1831 the company became known as Bywater, Dawson & Co. So the telescope appears to date from the 1820s. 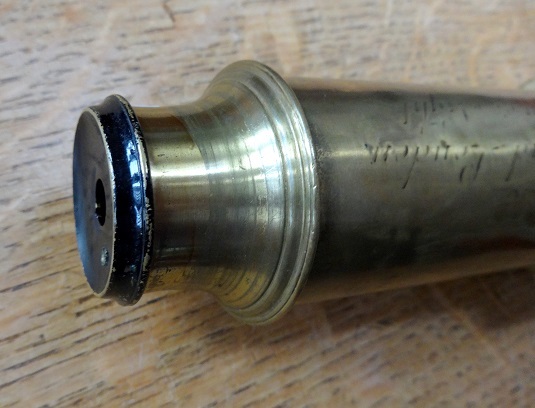 This telescope belonged to the correspondent’s great-great-grandfather, Ted (or Theodore) Corner, born 1826, and one of ten children of Sarah and James Corner: Ted became a ship’s Captain in the company James Corner & Sons, who were trading from Baltimore in the 1840s through to the 1860s. The main barrel is 5 feet long: the objective lens diameter is 4” (100mm). The single draw has a total length of 26”, and is approx. 1.625” diameter. This has another engraving, stating “Sold by Bywater & Co, Liverpool”. The second lens pair in the eyepiece tube is situated about 12-14” down the tube. These lenses are in a long cartridge, which itself is a tube around 4.5” long. This screws into the split joint in the single draw. The eyepiece unscrews from the near end of this draw and contains one lens, the second lens of this pair is mounted inside this tube. The telescope has been cleaned and assembled, but because of the size and weight (and the lack of a suitable ship and/or crew), it has not been possible to prove whether the assembled telescope functions correctly. 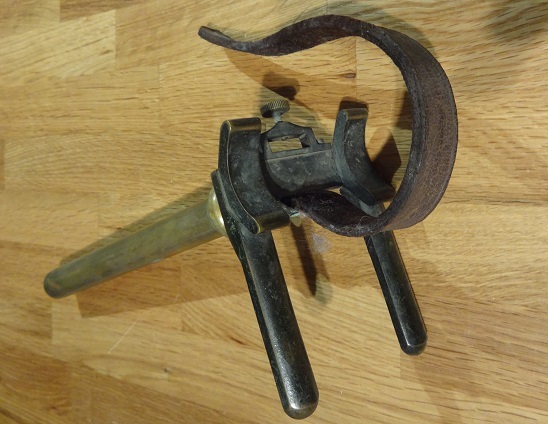 Around the main barrel there is a clamp ring, whose position looks to be adjustable, but would appear to be associated with a similar large screw hole in the barrel. 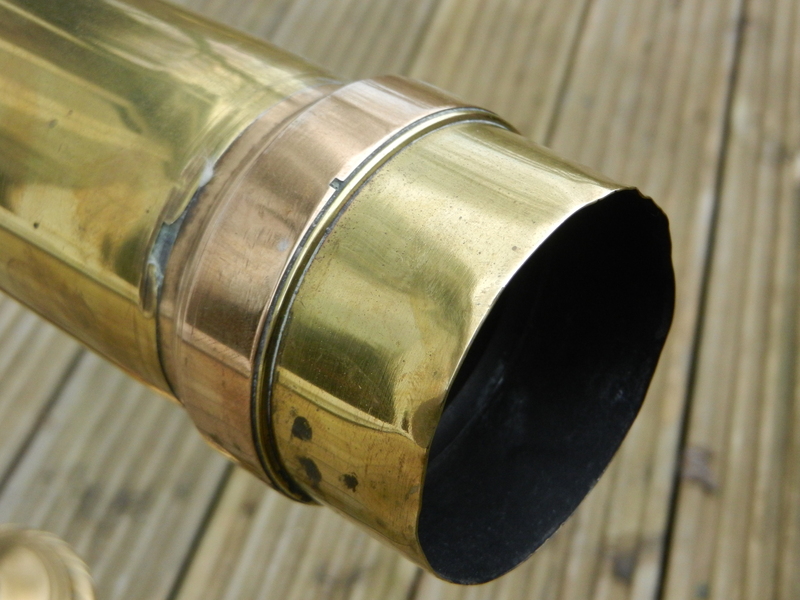 The clamp ring and the hole in the barrel look to be adaptations for mounting the telescope on-board ship. The stand, consisting of two prongs, has a top plate, which attaches to this screw hole: it is presumed that the threaded pins at the bottom of the two prongs that make up the stand would attach to a wooden or other stanchion provided as a part of the ship structure. The mounting plate allows sideways rotational movement. A separate attachment point on the barrel is provided, presumably for a handle or rod to control the elevation of the scope, rotating round the axis of the mounting screws located onto the stanchion (See the top photo, next to, and on the left of the clamp). It is surprising to me that such a large telescope (ie 6 feet long and deck mounted) was used on-board a Clipper like the Carrier Dove, but this certainly seems probable. Based in Baltimore, James Corner & Sons employed all six sons of James Corner at various times, but possibly Ted’s main role was as a captain of one or other of their ships. 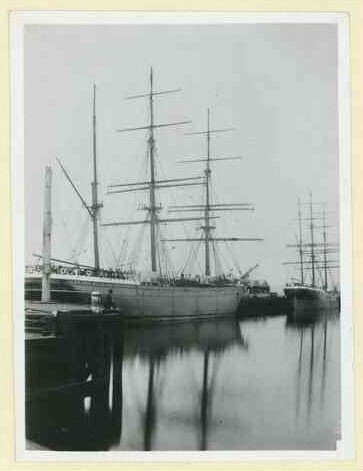 These included the Carrier Dove, the barque Huntington, bought by Ted Corner in 1854 and used as late as 1860, the Maria, and, all in 1859, the North Carolina, the Birchhead and the bark Seneca. Most of their trading activity involved voyages from Baltimore to Valparaiso, near Santiago in central Chile, via Cape Horn. Normal cargoes on the way out were pig iron, or in one case at least, a locomotive steam engine was delivered to San Francisco for the young railway there. The return journeys usually involved a cargo of guano, from the droppings of seabirds, seals, or cave-dwelling bats in Chile/Peru: this was valuable as a fertiliser. (Similar freight was possibly carried by James Bichard on the East Croft in 1895, from San Salvador, see the story published on www.telescopecollector.co.uk on 25 Aug 2014). Ted Corner started his sailing career in 1846, when the Baltimore Historical Society quote that he opened first transatlantic packet line, from Baltimore to Liverpool. 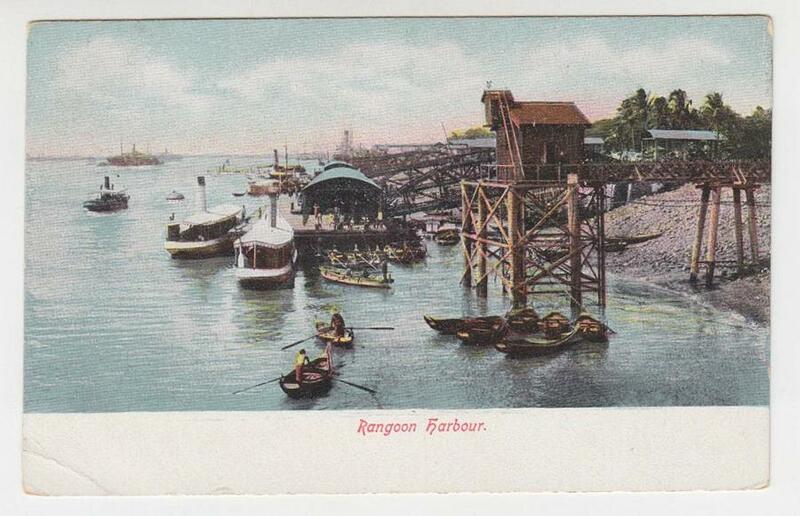 Maybe he purchased the telescope (possibly second hand) on one of these voyages? 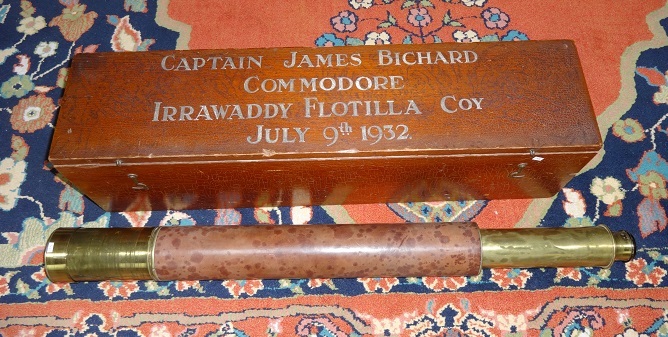 Or the telescope might even have been bought by his father James, on an earlier voyage to Liverpool, to fit with the 1822-31 dating of the first sale of the telescope. One of Ted Corner’s later, regular ships was the Carrier Dove. 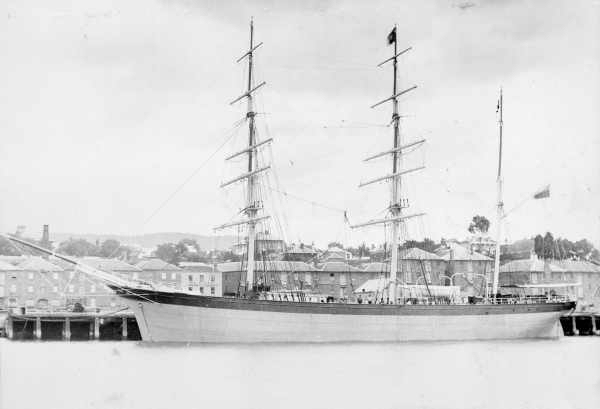 It seems this was a relatively famous medium Clipper, 1694 tons, launched from Baltimore in 1855: on her maiden voyage to San Fransisco under Captain Corner, Carrier Dove was dis-masted in a hurricane just eight days out from New York. Nevertheless, she made it to Rio de Janeiro in Brazil by November 9, in 55 days, and then remained in Rio for two months for repairs. 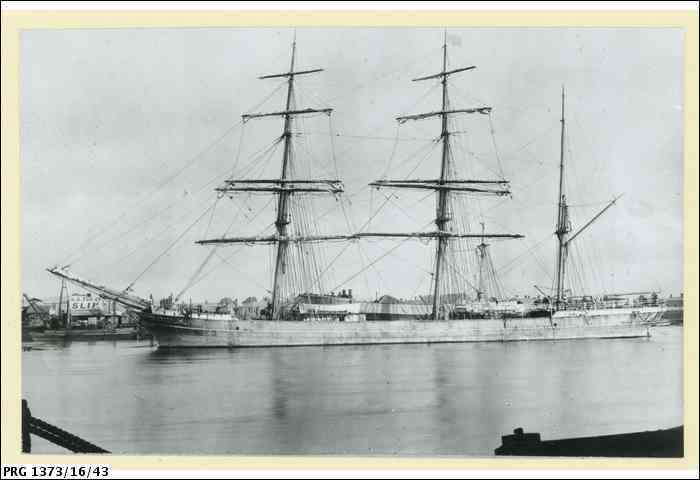 In 1856 Captain Corner was in Australia: presumably travelling from there to Peru, in 1857 he sailed the Carrier Dove from the Chincha Islands, off Peru, to Liverpool, with 1094 tons of guano: it was delivered to Anthony Gibbs & Sons. Carrier Dove was fast, in 1858, presumably on the return journey, Captain Corner sailed from Liverpool (UK) to Melbourne Australia in 78 days, and then on to Valparaiso in Chile in a near record 30 or 32 days (Wikipedia). A painting of the Carrier Dove exists in the Noble Maritime Museum, in Staten Island, New York. Later, in 1876, when no longer a part of the James Corner fleet, Carrier Dove was wrecked three miles off Tybee Island, Georgia, en route from Liverpool. See www.carrierdove.org for extensive further info. For anyone interested in further information about Ted Corner and his Baltimore Company, or in researching this telescope further, please make contact with the owner via this website. 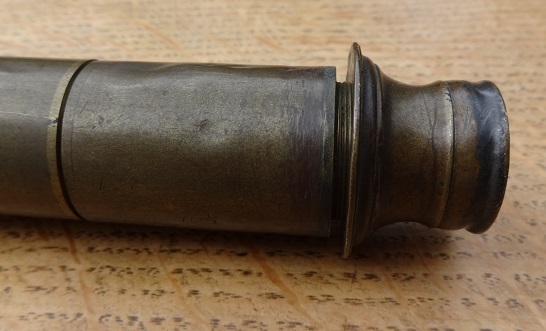 It’s very important to a collector to actually have an example of one of these multi-sided telescope designs in any collection, as they are some of the oldest, and in some ways most interesting. So I have usually bought any that I saw that were a reasonable price: but because they are old and desirable, they were not cheap! The story was told in the previous article about the Dollond 8-Sided telescope from 1860. The construction of this one used eight identical strips of mahogany, about 7/8” wide, with the inner edges filed down, so that they can be glued together in an octagon. This is then held together with the brass rings at each end, retained by small screws. This style was obviously the “one to have”, so that possibly later, and maybe smaller telescopes copied the design by taking a round length of wood, drilling out the centre, then planing flats onto the external surfaces. I would suggest that most of the smaller hand-held decagonal telescopes, ie the ones with 10 sides, and ones with any larger number of flats, would be made this way, as it would be more difficult to get 10 narrow strips to glue together neatly, and it is maybe easier to plane off the round barrel into ten sides. Having said that it does seem that planing the unit into 8 flats would be easier for me, as the angles of each flat would be simpler to get right. So let’s look at these other four multi-sided telescopes to see what emerges. This one, pictured at the bottom of the group above, is an un-named oak barrel, eight-sided telescope: the wooden barrel is 12” long, 1.375” wide from flat to flat. It has a bell-shaped eyepiece, a very narrow diameter objective, at 0.625”, and the single brass draw has three joints to mount the internal lenses, plus one at the very top of the bell: this lens is designed without any protection (like a covering slide). The objective does have a sliding cover. The telescope gives a really good magnification, say x12. This unit is constructed from a single length of wood, drilled out with a smooth straight bore. The eight joints between the flats are relatively sharp edges, simulating the appearance of a unit made from strips. Perhaps unusually for this design the draw tube is trapped in the main barrel, so does not pull out completely in use. This is the same design as the oak unit, but bigger, built from mahogany – and it has ten flats on the outside of the main barrel. Here the lens closest to the eye of the user is positioned as if recessed a little into the bell housing, and there is a slot for a slide to act as a cover: the actual slide is missing. 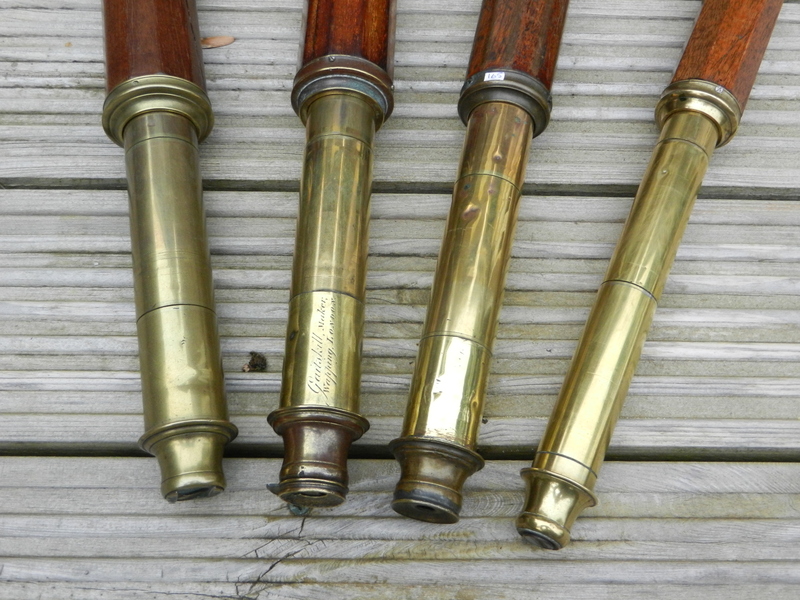 The other three lenses in the barrel are mounted at two screwed splits along the length, and the last is at the objective end of the draw, which pulls out freely, it is not retained in the barrel. If I saw the machined groove at the end of this draw on a modern piece of equipment I would say it was designed for an ‘O-ring’. This might indeed have been used to give some resistance to pulling the draw right out, and it could be squashed through in the assembly of the unit – there’s no other way of getting it inserted in practice. 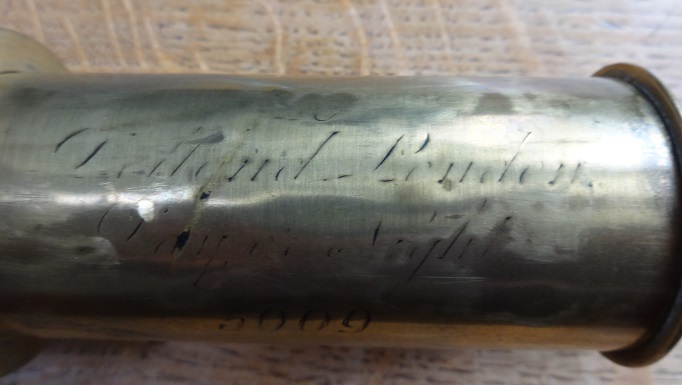 Left is this telescope: right is a typical example of a legible Dollond signature! At the objective end, the lens aperture is 1”, and the glass is protected by a sliding cover. 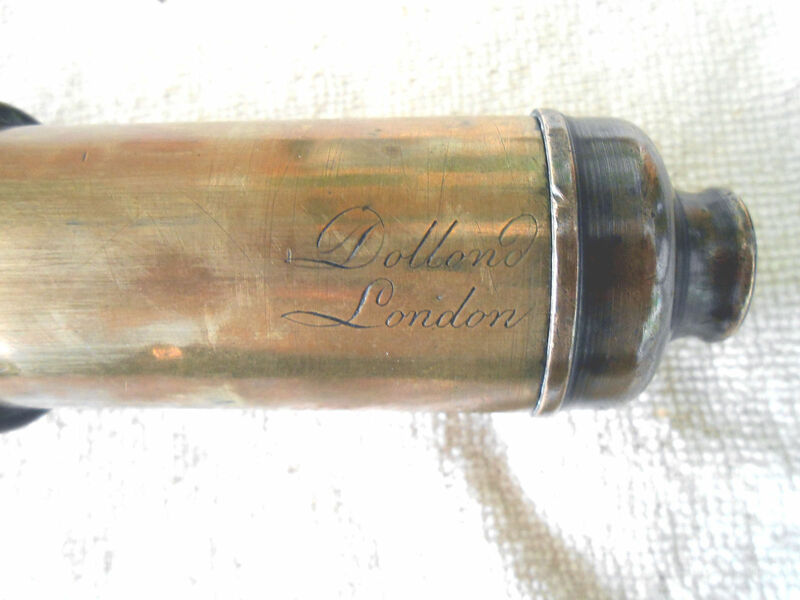 The remains of a signature are visible, engraved into this cover, and it corresponds with “Dollond London” in a script form that corresponds with that seen on other Dollond telescopes. The barrel is interesting, in that the inside bore is circular, and the outside is cut with ten sides, but the transition between each of the sides is very much smoothed over, consistently along the 24.5” length. The telescope actually has a split which extends maybe a third of the way along the barrel, which follows the grain and moves from one flat side to the next. 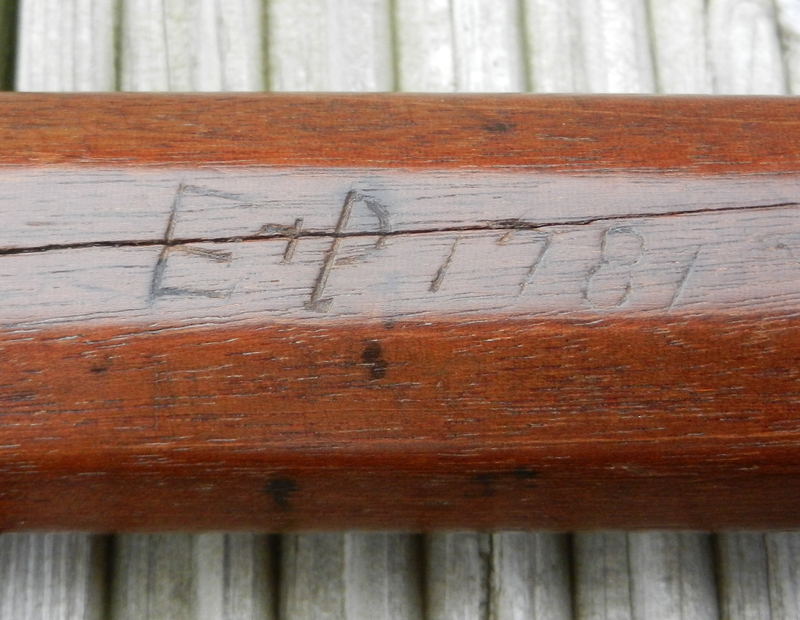 Possibly this split was caused when someone was hand-engraving his initials “E+P” on one of the flats, which remarkably is followed by “1781” which is presumably the date of this engraving work. [To put this into context, Captain Cook discovered and mapped the east coast of Australia in his voyage from 1768 to 1771, and then was killed in Hawaii in 1779. Dollond’s patent on the two-part objective lens was dated 1760]. The distance across the flats at the eyepiece end is 44mm, whereas at the objective end this distance is reduced, to 39mm. This is effectively a reverse taper in the outside size of the barrel. Inside, the bore of the hole is constant at 30mm, from the objective back to the orifice half way along the barrel, which has a diameter of 19mm. From there the internal diameter increases towards the single draw and the eyepiece, so mirrors the effective reverse taper seen on the outside. The brass draw is about 30mm diameter, and the brass sprung slide that holds it in place is around 3” long, inserted inside the barrel. 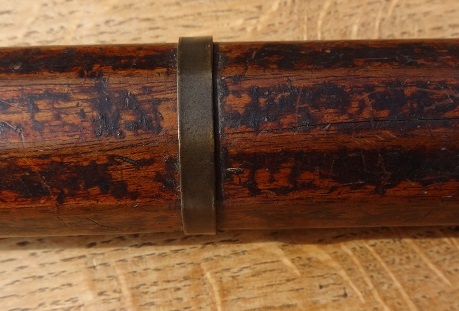 Another longer mahogany 10-sided unit, similar to #59, but here the barrel is visibly tapered in the normal way, with the larger diameter at the objective lens. The barrel is 24.5” long, including the brass end fittings. But the flats are flat, without the obviously rounded corners at the edges of the flats seen on #59. At the eyepiece end, the barrel is 43mm across the flats, outside, and at the objective end, this measurement is 48mm. Each flat is about 14mm wide. Inside, the internal bore is straight half way down the tube at the eyepiece end, and then slowly increases towards the objective lens position. But this is not to allow the use of a large objective lens, as very close to the objective (~20mm) there is an aperture/orifice, with a hole diameter of only 16mm. The brass housing holding the objective is 50mm diameter, and the lens itself has a visible diameter of around 30mm: but this lens appears to have a coating of some form around the edges, which might even be glue. The effectively useful diameter of the central part of the objective is around 21mm. 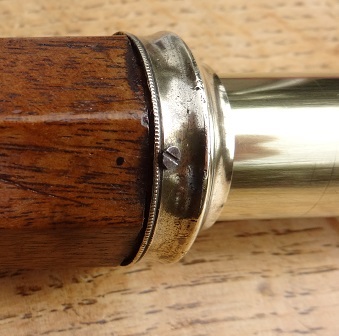 The objective does not appear to unscrew, to remove the lens holder from the brass screwed to the end of the barrel. So since the screws here do not look original, these were taken pout to inspect the lens. The result seems to indicate that the outer edge of the lens doublet has a different focal length to the middle section. The apparent colour difference is possibly that only the centre section is ground to the correct radius to nestle into the second lens, and where the two do not touch gives an impression of a coating, because of the different reflectivity. 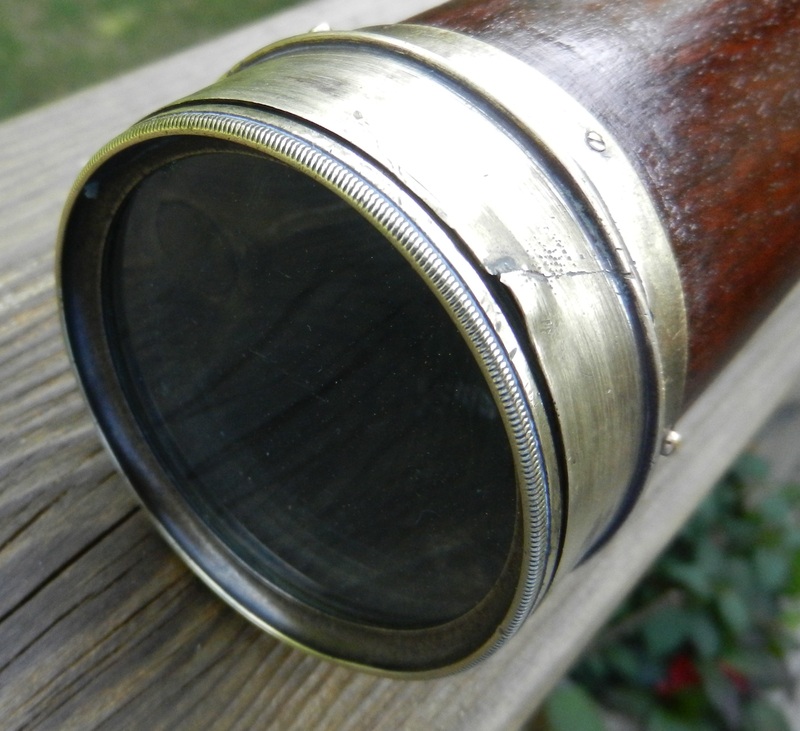 Having such an objective means that the close aperture inserted in the barrel would have been essential so as not to allow the outer edges of the objective to transmit light down to the eyepiece. Again the single draw pulls out of the barrel completely, just after the last lens in the eyepiece set of four, so the barrel has two screwed splits. Similar machining on the end is not a groove, but a raised rim on a section of the draw tube which has a smaller diameter than the rest of the tube, so maybe it was wrapped in some material or felt to push through and make an end stop. The two draws are almost interchangeable between #59 and this one, which is reference #189. 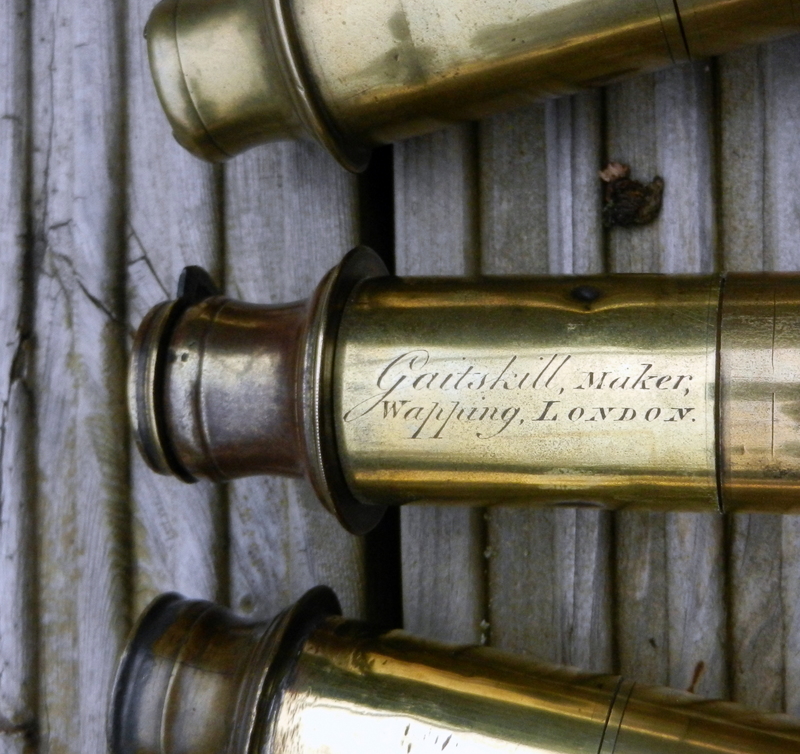 Here though the draw has the words Gaitskill, maker, Wapping, London engraved on the very first section of the draw tube, on the left, ie with the ‘G’ of ‘Gaitskill’ adjacent to the eyepiece, which is the early style. The slide over the eye lens has lost its retaining pin, so is in danger of pulling out completely and getting lost. When focussed, the single draw is only pulled out by around 2.5”. Magnification is slightly better than the Dollond #59, at maybe x7.5. Reference is #189. Joseph Gaitskill operated as a Ship Chandler, Compass and Mathematical Instrument maker from various addresses in Wapping from 1778-1811, but was called Gaitskill & Co from 1805. So this telescope also dates from the 1790s approx. It’s all there, except for one bit that’s missing, that is. 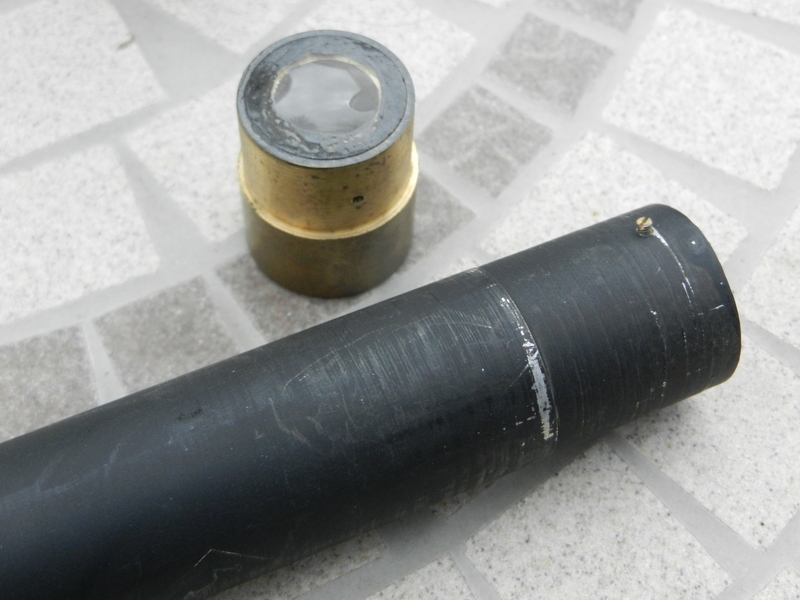 The missing bit is the objective lens, and carrier: it was screwed into the end of the barrel, but has either been knocked off, or fallen off, either overboard, or otherwise it was lost. The barrel is externally 10-sided, mahogany, with worn French polish. A third of the way down there is a brass band around the barrel, which is screwed down at one point, maybe holding the barrel together, as there is a split along this end of the barrel running down half the length. Externally the barrel is not tapered, and is about 42mm flat to flat. The internal bore is round, and is also a constant diameter, at about 36mm, but 3.5” from the objective there is an internal orifice with about an 18mm aperture diameter. So the ten sides are produced by planing down the round barrel into a series of flats – again the transition from one to the next is relatively smoothed over. The single draw has three screwed splits, but the second split going towards the eyepiece has a cartridge containing two separated lenses: overall there are five lenses in this single draw, which pulls straight out of the barrel. While this single draw fits into the other telescopes described above, very loosely, the optical properties of this draw and the other objectives are not compatible. The lenses used do not appear to be incorrect in any way, so they are all there, but as the saying goes, “not necessarily in the right order”. It just looks like a real problem to understand! Project ref #165. Dollond 4 draw, mahogany barrel – a good punt! When you scan Ebay and find a “Dollond 5 draw”, it’s bound to be worthy of attention. This one was really different, by the shape of the eyepiece, but the description only had two pictures, not that they showed very much. It was described as “possible Navel”, which maybe described the shape of the eyepiece, rather than the intended use. The final downer was that mid way thru the auction bidders were advised “there are no lenses inside”. Sometimes you have to take a punt. And I apologize to ‘m***m’ who was the only other bidder who also thought like that – he only pushed the price up to £47.99. The telescope duly arrived, and really did have 4 pulls, or ‘draws’. The really attractive part to me, apart from the eyepiece shaping, was that it had two joints in the first draw, to access the lens positions: one lens was indeed missing, the second. hree eyepiece lenses, the first, third and fourth were present. To me, the split draw does indicate an early date of telescope, I estimate around 1800-1820. The eyepiece shape maybe pushes you to an early date too. This design introduces a problem for the user, in that it is slightly difficult to pull out quickly, because there is little to get a grip on. So maybe it predates the Georgian/ Victorian bell-end type eyepieces, which must have been a subsequent design. The engraved “Dollond, London” is on the left, the more modern style, not the right, as it would have been in the 1700s. So, a lovely telescope, missing lens 2. Most of the lenses in this position are of a large diameter, very convex towards the objective: a spare lens of this type did not seem to work, ie to make the telescope focus properly. So a replacement lens assembly, consisting of lens 1 and 2 was tried, but that did not work either. Eventually a slightly smaller diameter dual convex lens in the lens 2 position was tried, mounted with Blu-tak, and the scope focused, but the field of view, ie picture size, was minimal. So the current solution is a similar, but larger lens, superglue-d into a minimal rubber ring mount, which gives a reasonable field and a decent focus. But the scope has to be used without spectacles on, the eye has to be very close. The search goes on for a better lens fitting, a larger diameter to improve the size of the visible view. The wooden barrel looked drab. 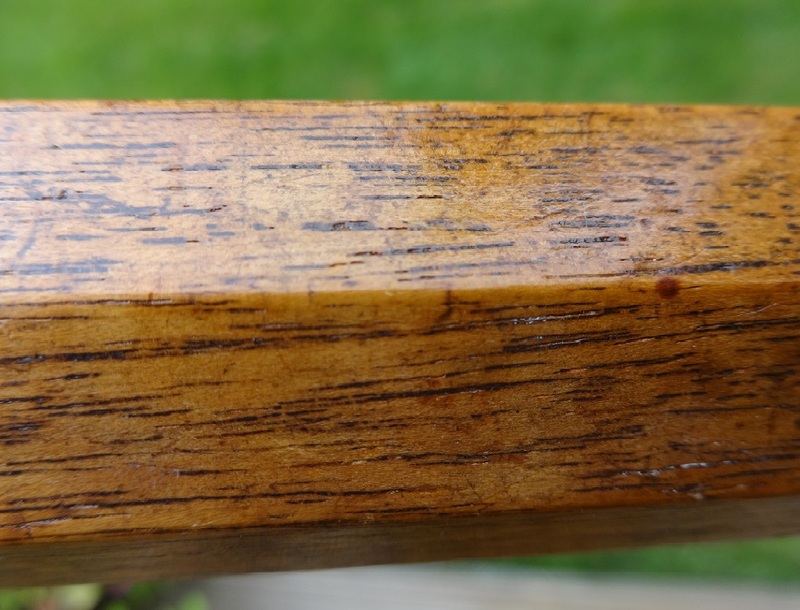 This was mainly down to the brown paint that had been added over the French polish. A couple of hours of scraping removed the caked paint, down to some lovely looking mahogany, with a couple of splits along the length. 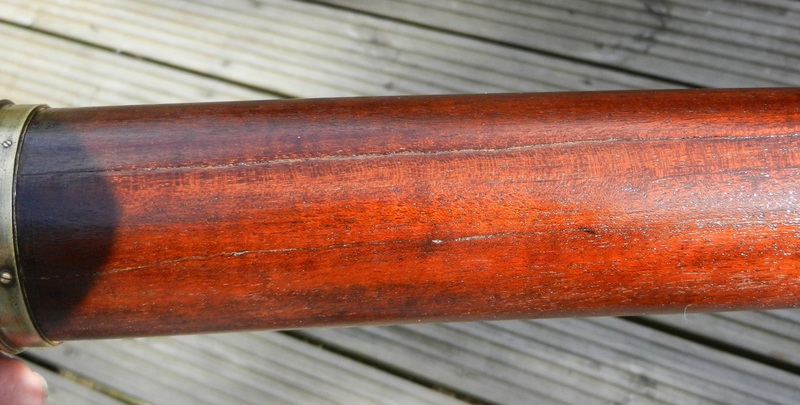 Sanding, re-gluing the splits, and polishing the barrel brought it up to a beautiful deep mahogany colouring, a process which continues with further coats. 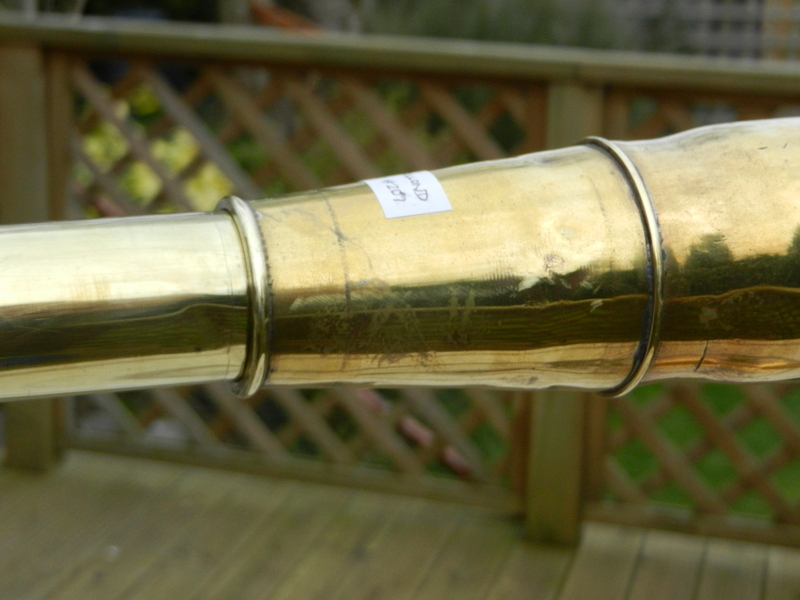 Unusually, this telescope brass responded well to machine polishing and buffing. The objective housing has had a couple of sharp cuts from knocks, but the lens screws in straight and smoothly. The eyepiece seems to be more of a bronze than a brass. The length of the telescope is the one thing you can’t hide. When closed it is only 11.5”. Open, fully, it is 44”, or 1.22m. When in focus it is only 41” long, and the second split on the first draw is hidden under the second draw. It is actually very light to hand hold, and the focus is soft, ie a lot of movement is tolerated in the focal point. So setting the first draw at the mark made in the metal is accurate enough to use. Currently the only slight problem with hand holding is the limited field of view, meaning the flexing of the joints for the draws is noticeable. 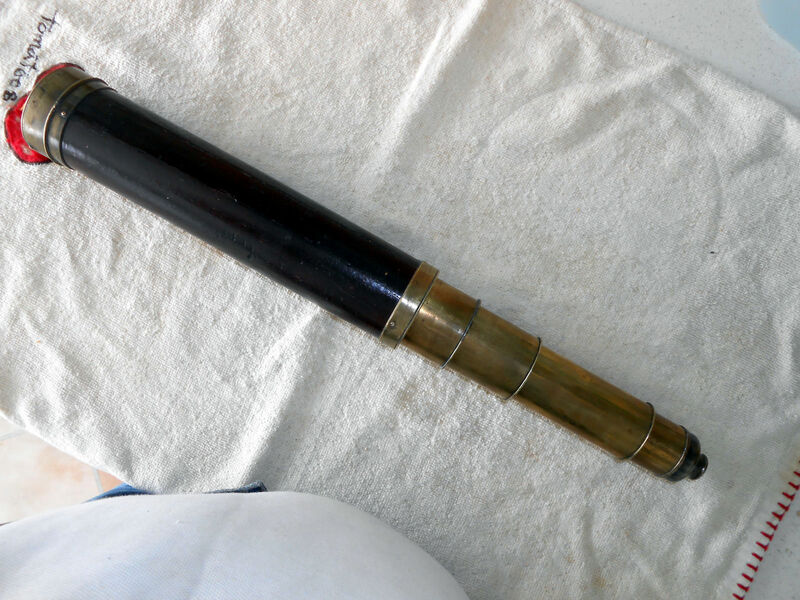 A 41” long Dollond mahogany barrelled Naval telescope, 4 draw, unique design, dating from maybe 1800-1820. Restored to being in working order with a new lens added, but this lens probably is the reason for the limited field of view/relatively small image diameter. The search continues for a more suitable lens. The telescope would probably be worth somewhere up to £500 in a proper sale. But it was a pleasure to have seen and brought it back to life. The following pics show the before and after condition, in as much detail as the Ebay seller’s pics gave -I’m sorry I didn’t take my own “before” pics! Ebay pic before: Then my pics after polishing! The way I define a Library telescope is that it is mounted on a stand that is intended for being positioned on a table, such that the user can sit in a chair and look through the telescope when it is pointing horizontally. 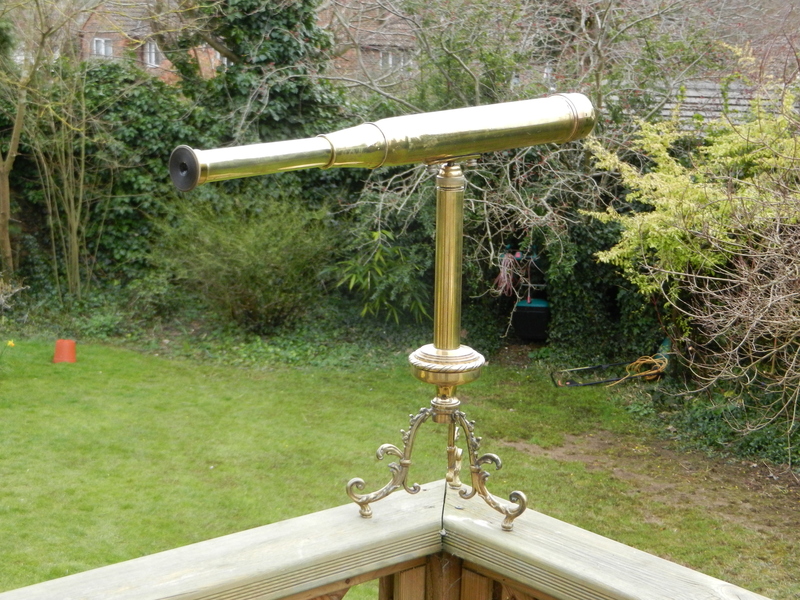 The sort of scope that would be in a bay window in a library, so that the reader can look out and easily use it to investigate the activities of a passing deer or fox on the estate, or see who in the hunt is in the lead. Such telescopes are designed for terrestrial use, not naval, and not astronomical. Pretty useless really, unless you have the estate to view, but they were popular in the 18th and 19th Centuries. They also look really good on a library table. This is a classic ornate library telescope, made and engraved by P (Peter) Dollond of The Strand, London, which leads to a date of 1760, give or take 6 years. 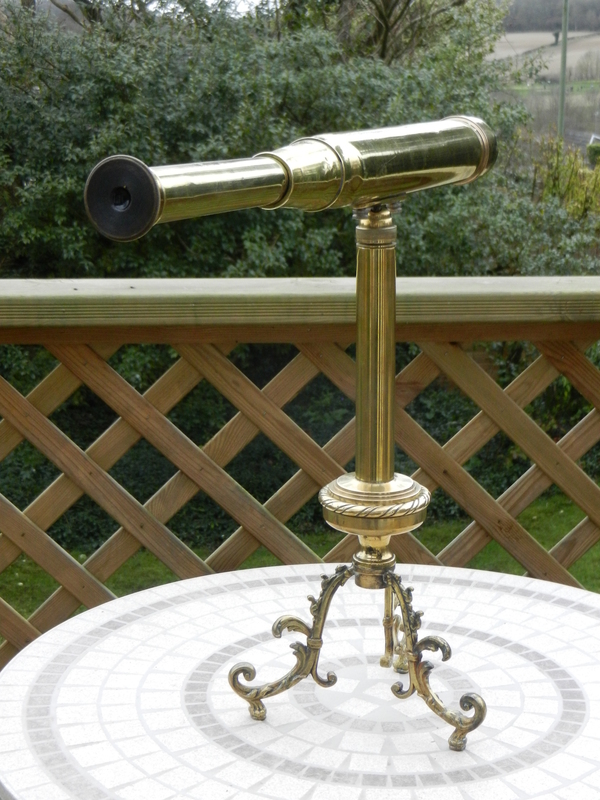 The stand is brass, with a fixed height of 17”, which puts the telescope axis at 18.5” above the table top. The tripod legs of this stand have feet that sit on an 8” diameter circle. 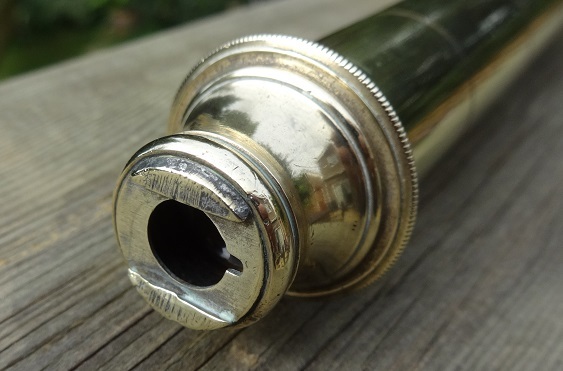 The brass telescope itself is attached via two knurled head screws into the lower part of the main body, which hold the telescope in a cupped bracket. Overall length is 26” extended, with an 18.5” body: this is 2.5” diameter at the objective lens, which is held in place in a copper fitting that provides the joint between the telescope body and the sunshade. The eyepiece end of the main body tapers down over 3.5” to join to the 1.25” diameter single draw. This draw caries the quoted engraving, and a line to show the typical focus point. In the photos you will see that the eyepiece terminates in a flat ended brass fitting with a female thread onto the single draw. This fitting is my own addition, as a repair, as the telescope arrived with no lens in the eyepiece, and what appears to be a very long eyepiece fitting, with parts missing, and a damaged lens holder. Inside the first draw a black internal sleeve, made of what appears to be aluminium, holds a standard two lens barrel, in brass, approx 5” from the eyepiece. Both these lenses are glued into the ends of the barrel, with black paint covering a significant part of the edges of both lenses. The two lens barrel is held in the internal aluminium tube using a single grub screw. At the eyepiece end there is no apparent method of mounting another dual lens barrel into this aluminium sleeve, but there is a shoulder to stop it entering too far into the telescope draw. It would appear that the second lens barrel would have extended towards the user further, hence the longer eyepiece construction. The whole original eyepiece lens assembly was difficult to understand, and not of a type seen before, so a replacement sleeve with two sets of lenses in barrels (the first draw from a later Dollond scope) was inserted into this P Dollond telescope single draw (it was an interference fit) and secured in position with the flat end eyepiece cover (from a JH Steward tapered body scope). The colouring of the eyepiece is just right for the rest of the telescope, and the combination of the lenses works brilliantly. The objective lens is original, and is a dual element construction, with each of the two lenses being considerably thicker than is seen in later telescopes. The optical quality of the lenses is excellent: the lack of chromatic aberration in the resulting image is noticeable! The big question is, what did the eyepiece look like originally? The only clue is the remaining part that came with the scope, that looks of the same age. This has the remains of maybe another lens holder assembly jammed/screwed inside, with various damaged threads visible. If you know of any similar old models, please let me see pictures! The second question is, how does the draw get extracted from the main barrel? Nothing on the main barrel unscrews, except for the objective lens holder. The first draw has a shoulder at the eyepiece end, so it cannot be removed through the main body of the scope. It seems it is not intended that it is ever to be removed. Why is it dated 1760? The telescope is obviously very old. 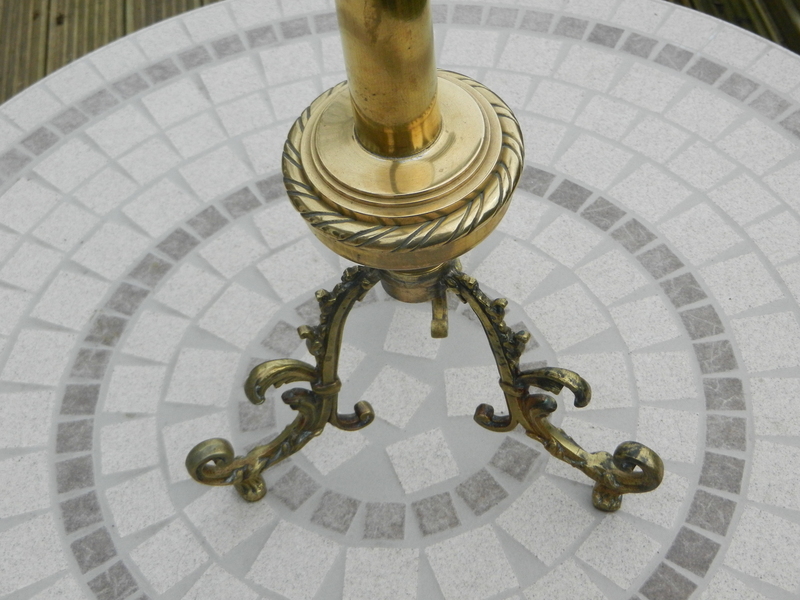 The body construction is unusual, with the tapered brass main body, and the stand is very ornate, as in pre-Victorian. The lens assemblies are also unusual, complex, expensive to manufacture, and look a little “one-off”, as if built to fit, after the main outer parts had been finalised. The lens is a dual element, so dates the design as probably after the publication and filing of the Dollond patent, which was in 1758: John Dollond joined his son Peter in their optical business in 1750, and slowly developed the use of achromatic lenses using the combination of the two glass types in a combination lens. 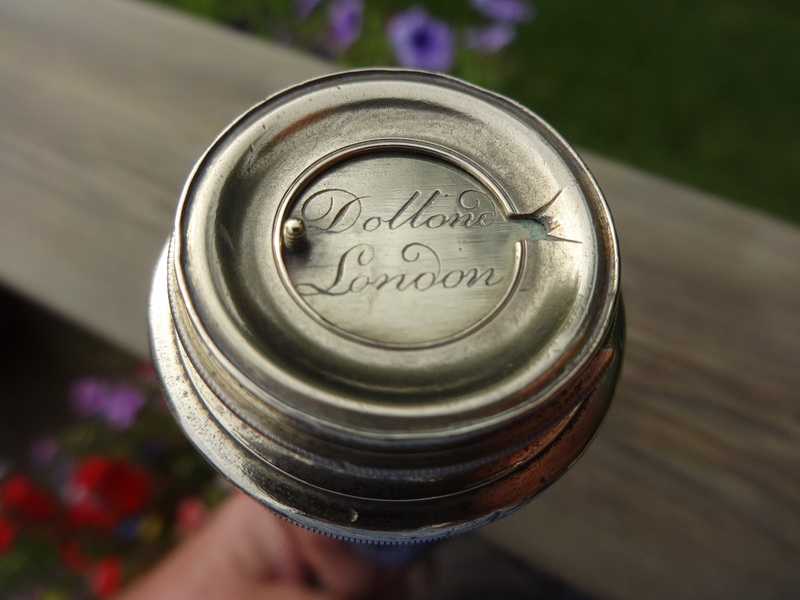 The engraving says P Dollond. According to Gloria Clifton’s Directory of British Scientific Instrument Makers, Peter Dollond was working 1752-1763 at the Golden Spectacles and Sea Quadrant, near Exeter Exchange in the Strand (opposite the Savoy Hotel); and then 1761-1766 near the Exeter Exchange in the Strand; and then from 1766 onwards at 59 St Paul’s Churchyard, near St Paul’s and the Tower. So after 1766, he was not located in the Strand. To a collector like me this is brilliant. To use a telescope that was made by Peter Dollond, in one of the first applications of his patent, 250 years ago, even though the eyepiece lenses inside are from one of his Dollond successors, is a real thrill. In reality it is a renovated item, rebuilt, and so the resale value is lower than an original version. But equally it has a good story, and makes a talking point. Plus it works beautifully. In an antique shop this would be put on sale for £2000+, but the real sale value is probably half that. Why, because if you want one, 250 years old, only a few made, where do you go to find another one? I bought the original unrepaired P Dollond parts on Ebay in December 2014 for under £80 including carriage. Maybe it slipped under the other collectors’ radars because it was quoted as a non-working ‘Dolland’ telescope. But it shows you can still find gems like this for reasonable prices. So keep on looking! The trouble is there are more and more people looking for telescopes now, so prices are going up, I am having to change my search targets, and specialise…….sometime I am going to have to start selling, the prices are so high. It’s currently a favourite item in the collection, listed as #226. So that’s 200 at least to sell before I part with this one.